*Read this issue of Holistic Happenings on the Web for graphics and easier link navigation. August's newsletter is different than usual. It is a letter to you, really, and I ask that you read it through to the end. Some parts of it were difficult to write and even more difficult to send out. Although much of what I've written is personal in nature, I hope that my story, introspection, and honest appeal is thought-provoking and of value to you as well. On my reading list was The 100 Day Promise: A Guide to Changing from the Inside Out by Sandi Amorin. What really struck me from the book was reading about the two types of values - core values and values that are in service to those primary values. Core values are part of who we are, almost like our DNA. They are part of our internal guidance system. Supporting values are also our values, but for lack of a better way to say it, they are important because they help us connect with and honor core values. For example, I love to learn, live to learn. I would have guessed it as a core value. But it isn’t. I learn because it helps me live out my primary values. That makes sense. I set out to figure out my core values by muscle testing my way through the list in the book (plus some others that came to mind) and confirming with my internal guidance system. I was in for some surprises. Primary or Core Values: Truth, Purpose, Contribution, Nature, Family, Relationships. Synthesizing this list of values and what the words meant to me formed the fodder of much food for thought (and more muscle testing). It all made sense as I put it together-the paths I’ve chosen, choices I’ve made, how and why I react to certain situations as I do, what’s important for me, how it feels when my thoughts, actions and circumstances are aligned with my values and when they are not. My most primary value revealed itself as Truth. My love of learning, research,and teaching has been in service of my quest for discovering and sharing Truth in its various aspects. That is a major part of my purpose and contribution. The great Truth I live in service to is to learn of and contribute to the awakening of humanity to our relationship with all of life - human, plant, non-human beings, the earth, and the Divine. I see the bottom line as this - we, as in all living beings, are one. Ultimately our survival, health, and quality of life depend on how we relate to and treat others and the earth. Whether we exercise right stewardship and relationship or abuse and misuse for our own shortsighted gain will ultimately and surely shape our personal and collective future. Living from my heart and soul values and cultivating them is no doubt a lifelong learning, transformational process that will have its ups and downs. Still, I believe it a life course worth pursuing. I want to consistently make choices that honor my values. This means giving more energy to my life message and less energy to thoughts and activities that are not aligned with them. It means making uncomfortable decisions about what has to go in my life, what can stay, what would benefit from some tweaking, and what I need to create more of. This has to happen for me to be attuned to my internal guidance system and aligned with it for my good and the good of others. From the beginning, my main motivation for writing HMBH was to empower and encourage you to take charge of your own mental, physical and emotional well-being. To take back your ability to heal and be happy from the inside out. To have Truth and to use Truth in making decisions about your health choices. I also felt that instead of hoarding reams of notes and gleaned words of wisdom, that it would be a service to share them with anyone who could benefit from them. My personal hopes were that google ads, affiliate promotions, and services would at least keep the site self-supporting. More importantly, it was and is also my dream that HMBH would provide a sense of community, a give and take where we would share our collective wisdom, and help and encourage each other. In the on-line world they call this engagement. I see now that this is where my value, Relationship, comes into play. I value a relationship with my readers and fellow members. Some honest words that are difficult to say... That this engagement has been minimal has been emotionally difficult for me. Sometimes feel like I am talking to myself and wonder if there is any point continuing. When the primary feedback I receive is the open rate and how many people have unsubscribed with each newsletter it’s hard for me to write the next one. To you who have written positive, supportive words, thank you. And I so appreciate you who I have gotten to know personally. So how I move forward with HMBH and the ezine is up for evaluation. What I want is to continue sharing honest, no-hype, common sense information and resources with you. But I have to know this is of value to you. I want us to learn and journey with together - to discover our Truth and walk our life paths from and for the highest good. This is how we change our personal and collective world for the better. I believe this may be one of the most overlooked and most important aspects of emotional, mental and spiritual wellness. If this is something you want to, I make this appeal. To make HMBH a go-to, successful resource, I need your help. I don’t have glitzy marketing, an advertising budget or a team of employees. It’s just you and me, if you want to be part of it. *Every so often, read a few pages on-site. Post comments or questions at the bottom of the page. Like and share pages and pin images you like. *Offer feedback about what you want to see on the site and in the ezine. Do that by replying to the ezine. *Write a community page post and comment on other writer’s posts. Our most popular to date- Talk to the Trees by Kathy Fitzpatrick. *Ask and answer questions in the member’s area. *Share site pages and ezines with family and friends who you think will benefit from it. *Fill out the member’s survey if you haven’t already. A new popular feature of the survey is that you can request more information about your interests and challenges and I personally respond by email with links to related pages for you. How will you benefit from this? You will get more posts and ezines targeted to your needs, a better site experience, a sense of community, and more engagement from me. The truth is that we all do better when we all do better. Know that it is alright with me if what is right for you now is just to receive the ezines without further engagement. You have to do what is right for you. Or f after reading my letter this far you realize that HMBH, this newsletter, or I am not a good fit for you, that’s okay, too. You may unsubscribe using the link at the bottom of this email. 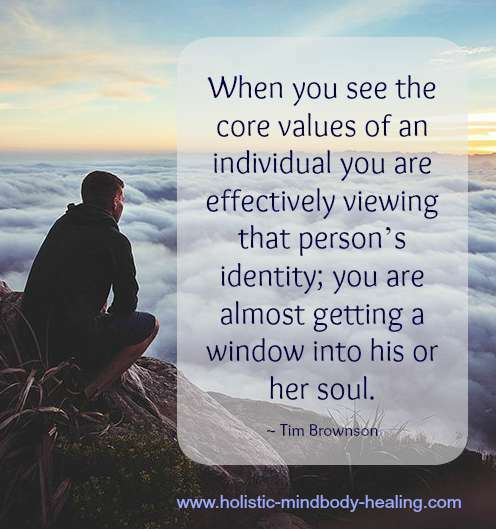 Discovering your values and how they shape your life is an ongoing quest. Living a life that is aligned with your values and honors them as much as possible will help you feel happier ad more fulfilled. To help you get started, check out this list of 418 values. I recommend you go through the list quickly and jot down whatever words pop out to you. Don't worry if you miss a few or add a few too many. Then from that list, see which ones really speak to you. Muscle test if you like and are good at it. But always confirm with your inner knowing. Be mindful that values are not necessarily what is important to you. A listed value can be something you like or find important, but not be one of your values. Your values are a significant part of what guides you, drives you, and makes you who you are.